2008 est un millésime assez frais que l'on peut qualifier de nordique. Il joue la carte de l'élégance et de la finesse tout en conservant sa chair méridionale. 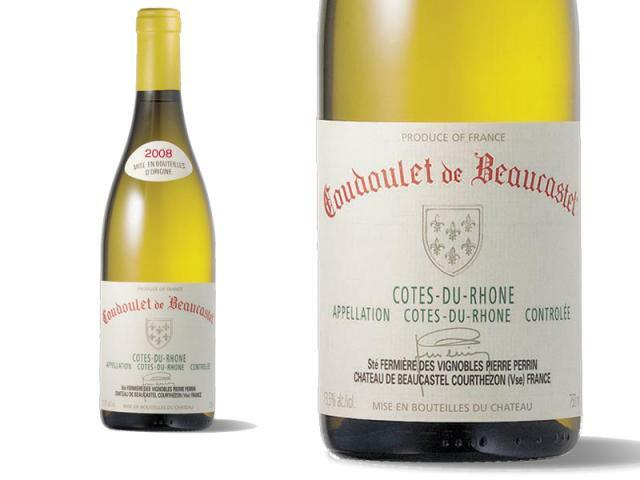 Under the Chateau Beaucastel label, the 2008 Cotes du Rhone Coudoulet blanc (30% Viognier, 30% Bourboulenc, 30% Marsanne, and 10% Clairette) tastes like a premier cru Chablis made in the southern Rhone. Notes of crushed rocks, quince, white currants, and lemon zest are present in this intense, medium-bodied, striking white wine. One of the great estates of the Rhone Valley, Chateau Beaucastel has been run by several generations of the Perrin family, beginning with the late Jacques Perrin (who died in 1978), then the brothers Jean-Pierre and Francois, and now their sons Thomas, Marc, Pierre, and Mathieu. Beaucastel has nearly 200 acres in vine in Chateauneuf du Pape, and they have branched out with an impressive operation under the Perrin et Fils label, purchasing grapes and acquiring land (in Vinsobres and Gigondas, for example). Their goal is to become the most recognized name for high quality wines in the southern Rhone. As shrewd consumers know, one of the best values in under $10 a bottle wine is La Vieille Ferme. The Perrin et Fils cuvees include wines made from purchased grapes as well as their new acquisitions in Vinsobres, Gigondas (25 acres), and the Cotes du Rhone village of Cairanne (35 acres). The Perrins enjoyed tremendous success with their 2008 red wines, largely because yields ranged between 18 hectoliters per hectare for Beaucastel, to only 20 hectoliters per hectare for Coudoulet. The mildew that affected everyone was the culprit. The entire family acknowledged there was an extraordinary triage and culling out of the grapes at the sorting tables. Very ripe and lush for the vintage, with delicious Jonagold apple and Cavaillon melon notes caressed by salted butter and macadamia nut notes on the long, creamy finish. Marsanne, Viognier, Bourboulenc and Clairette. Drink now. 600 cases made.